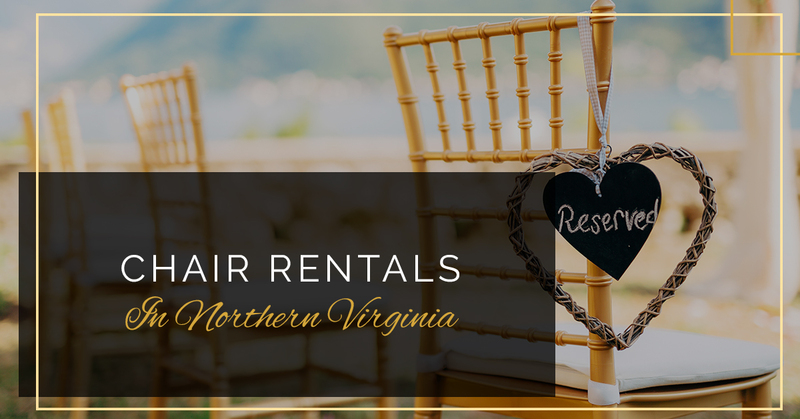 Chair Rentals Northern Virginia: Chiavari Chairs, Folding Chairs, and More! Signature Event Rentals provides beautiful table and chair rentals to fit every budget and occasion. Learn more about our chair rentals for weddings, outdoor events, and corporate gatherings below! Based out of Fredericksburg, we are happy to serve a wide area of Northern Virginia and Washington D.C. with superior table and chair rentals for weddings, corporate events, picnics, and more. Whether you are throwing a small get-together or a huge party, we have chairs to fit every event and budget. Which Chair Rentals Are Right For Me? Our most affordable chair rentals are our non-padded white folding chairs. These start at just $1.50 per chair and are an excellent choice for casual picnics and events. The next level up is our padded folding chairs, which start at $3.00 per chair. These lightweight hardwood chairs are ideal for outdoor or afternoon weddings or nicer indoor events. We also have gold and silver Chiavari chairs for rent. Our Chiavari chair rentals are perfect for black-tie events or weddings where you want to create an elegant environment. These chairs are used everywhere from gala dinners to royal weddings and are ideal for those looking to create a truly spectacular event. Finally, if you want something extra special for a wedding, quinceanera, or other event where one or two people will be the star of the show, then our throne seat rentals are an amazing option. You can rent a single throne or a loveseat throne and feel like royalty. When you choose Signature Event Rentals as your preferred party rental company, you get access to all of the items you need to ensure your next event goes off without a hitch. Not only do we provide affordable chair rentals, but we also offer table rentals, tent and canopy rentals, linen rentals, and entertainment options like bouncy castles, dance floors, and speaker systems. In short, we are your one-stop-shop for all of your event rentals in Northern Virginia and Washington D.C.
At Signature Event Rentals, we pride ourselves on showing up on time, setting up your rentals to your specifications, and only providing the highest-quality rentals that are safe and reliable for you and your guests. You will be amazed at the sturdiness of all of our chair rentals, from the most simple white folding chairs to our gorgeous thrones. Choose Signature Event Rentals today for folding, throne, and Chiavari chair rentals, table and linen rentals, and anything else you need for your upcoming event. If you have any questions or special requests about our party and wedding rentals, feel free to get in touch with our friendly staff who can answer all of your questions and find the right chair rentals for your next event!